Delivering on its mission to connect businesses and policymakers across the Pacific, the Japan Forum for Innovation and Technology (JFIT) at the UC San Diego School of Global Policy and Strategy (GPS) is at the heart of a major new collaboration between San Diego and Tokyo’s life sciences clusters. 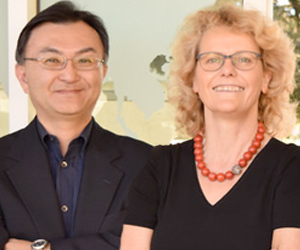 JFIT Director and GPS Professor Ulrike Schaede and JFIT Executive Manager Takashi Kiyoizumi have been recruited to serve in the Board of Supporters of the Life Science Innovation Network Japan (LINK-J). Alongside distinguished scholars such as Nobel Prize-winning stem cell researcher Shinya Yamanaka, UC San Diego Interim Executive Vice Chancellor for Academic Affairs and GPS Dean Peter Cowhey is a member of LINK-J’s Advisory Board. Established in April by the Mitsui Fudosan Co., Ltd., a major real estate developer in Japan, LINK-J is an incubator dedicated to facilitating interactions among industry, academia, government and public sectors in Japan. It is housed at the Nihonbashi Life Science Building in Tokyo, where UC San Diego also recently launched its first-ever workspace overseas: UC San Diego Tokyo Office. The involvement of Cowhey, Schaede and Kiyoizumi in LINK-J is related to GPS’s connections to Kan Suzuki, a special adviser to the Minister of Education, Culture, Sports, Science and Technology in Japan. In his previous role as vice minister at the ministry, Suzuki played a formative role in structuring the Nihonbashi health science cluster project. 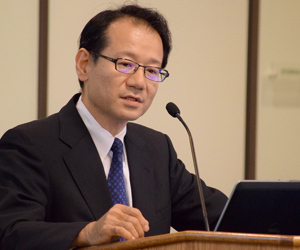 In 2014, Suzuki came to UC San Diego as a Pacific Leadership Fellow at GPS’s Center on Global Transformation and at that time helped spark the idea to create JFIT. Cowhey, Schaede and Kiyoizumi are excited to be involved in the LINK-J project. In addition to the UC San Diego Tokyo Office, this connection brings a direct tie-in in policy and strategy shaping not only Japan’s largest emerging bio-incubator and biocluster, but in regard to entrepreneurship and innovation in Japan more generally. Hideyuki Okano, the chairman of LINK-J and dean of Keio University School of Medicine, expressed his gratitude to have Schaede and Kiyoizumi serving as the only non-Japan LINK-J supporters.